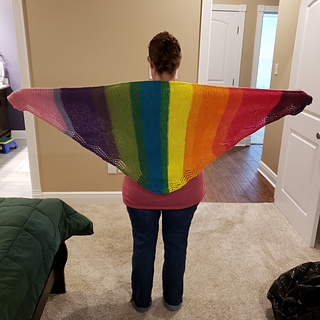 Wingspan, 78”; center back length, 29”; short sides, 47.5”. The lace on this shawl was inspired by the Spanish Peaks, a pair of prominent mountains near the Sangre de Cristo Mountains. They were the first mountains I saw on the way to visit my daughter’s family in Southern Colorado. Coming from the flat lands of Iowa, these mountains are very impressive. 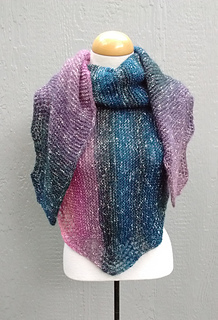 This is an easy to knit, garter stitch shawl, great for a yarn with long color changes. It is worked from end to end increasing to a triangle and then decreasing again. The lace is an easy to memorize repeat with a two-stitch I-cord edging for a beautiful finished look. 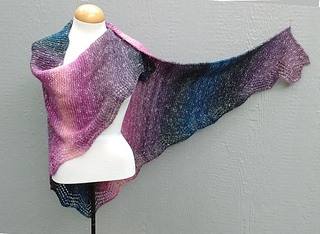 The size of this shawl is easy to adjust to accommodate your taste and available yarn. Other weights of yarn could also be used with adjusted needle size and varying the number of repeats to give the size you want. Suggestions for these adjustments are included in the pattern. 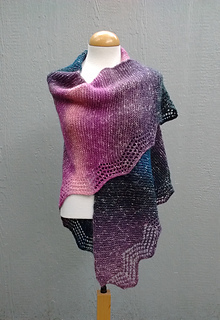 Note: A change in weight of yarn or size of shawl will change the amount of yarn needed.